I’m slowing but surely going back to re-read the IAD series from Kresley Cole, but this time I’m listening to them. It’s all thanks to the Fated Mates Podcast. I love listening to the podcast after I’ve listened to the books because they reveal so much of why I picked up this series back in 2009/2010 when I was in the Navy. I love this series and I friggin’ love the characters. I’m anxiously waiting for Nix’s book. She’s my all-time favorite character of the series because she’s so quirky and funny. She’s ever-knowing too. If there is one thing I love about re-reading (or in this case listening), a book is that I get to enjoy going back into a story I loved. 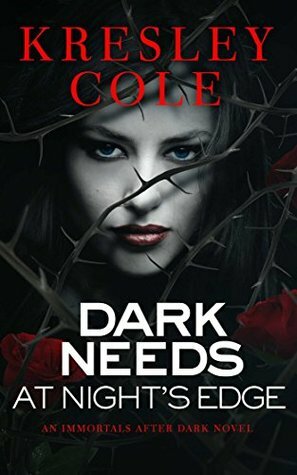 Dark Needs at a Night’s Edge was one of my favorites when I read it first in 2010/2014. I couldn’t wait to dive into learning more about Conrad Wrath and which female character would win him over. He is a Wroth, but he’s not like his brothers. He’s too consumed into his bloodlust and hating his brothers for what they did to him in the past. Unfortunately, he never thought a sweet female would change his mind about his current situation his brothers put him in. His brothers have imprisoned him in an old home in Louisiana to get him better hopefully, but he’s not going to make it easy for them. He has a phantom bugging him always in the residence he is now confined to live in at the moment. No one else can see her but him, and he’s intrigued by her. Naomi was once a famous ballerina, but she was murdered one night, and she haunts her home to keep away trespassers, but the minute she meets Conrad, she realizes there are scarier creatures out there that she didn’t know about in her life. She’s intrigued by Conrad and the rest of the other world creatures though and is also happy that someone else can finally see her. The handsome vampire also attracts her.Kresley Cole did a beautiful job on making such a ruthless character show a different side. Conrad never wanted to become what he was, and he had it rough from the beginning of accepting the change. I felt sympathetic for him since the moment he was mentioned in previous books. He was the long-lost Wroth brother, and I was ready to learn more about the ruthless brother. It takes a beautiful ballerina phantom to show Conrad what he is capable of being a sweet guy. Do I recommend this book? Yes, most definitely. I highly recommend this series to PNR readers out there.